Twelve nifty tales, quite possibly the last from the drawer of L’Amour (1908–88), as collected and edited by son Beau L’Amour, who is also gathering material for a L’Amour biography. 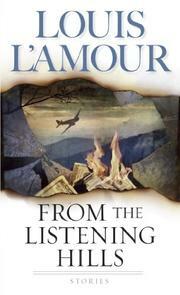 These entries, three never before published, include the first and last that L’Amour wrote. Kickoff is the masterful “Sand Trap,” a fearless melodrama stained with human feeling: A man wakes up on a kitchen floor, no idea how he got there, his scalp split to the bone; he can barely move, there’s a dead man beside him, and the house is on fire—and quickly L’Amour rouses sympathy for this trapped soul. How’s that for an opener? “Anything for a Pal,” L’Amour’s virgin effort at storytelling, shows great skill at handling clichés as it tells of Tony Kinsella, torpedo for a mob boss, who has to kill a witness to save his boss from the chair. To measure L’Amour’s growth from this clean-limbed but banal work to each of the other stories should cheer any tyro writer hoping to learn. The title story, one of the longer tales here, finds L’Amour sinking into a blaze of plotting as the Tremayne family rebuffs death threats and false arrests and goes into hiding from various posses. The story carves a large arc and is especially brilliant in the romance between the storyteller, to whom a woman is as rare and strange a creature as something from the depths of the sea, and the girl he marries but then must leave, though she’s pregnant. L’Amour’s very last story, “The Moon of the Trees Broken by Snow,” finds him, like Homer in the Odyssey, moving from realism to abstraction and magic. In some dateless period in the past, a 12-year-old boy, now head of the family, leads the family from their drought-stricken homeland to a new land that he’s led to by a large star in the southern sky. We’ll say no more.